By	Allyson Haymaker. Last edited by Marios Alexandrou on July 3, 2018. I can't think of a better place to pay tribute to America's veterans than my hometown of Emporia, Kansas. Located in east-central Kansas, Emporia first observed Veterans Day — or as we often call it, All Veterans Day — a full year ahead of everyone else. Back in the early '50s, the country still celebrated Armistice Day, which marked the end of World War I. But Emporia shoe repairman Alvin King, who lost a beloved nephew in World War II, thought it more fitting that the nation honor veterans from all wars and conflicts. Emporia was hit hard by the war, and Alvin's idea caught on. 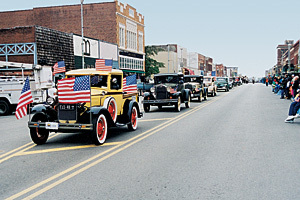 Emporia marked that first All Veterans Day in 1953 with a parade, a wheelchair basketball game and other activities. And the next year, President Eisenhower changed Armistice Day to Veterans Day. Emporia took things a step further a few years ago and stretched its patriotic tribute to a whole week. And the whole town gets in on the festivities. On the holiday itself, we hold a parade, of course, and a memorial service and an Air Force band concert, among other activities. But there's lots more events during the week leading up to that day. For instance, Camp Tribute, set up at the Lyon County Fairground over the holiday weekend, is an eye-opening look at life on a military field base. You can hear riveting firsthand accounts of veteran's experiences. You can also check out local arts and crafts. The fairground becomes a battleground when some of the military equipment and vehicles on display rev up for a spine-tingling World War II battle re-enactment. On a lighter note, the USO Show is always pure fun, with music, comedians and stars like those seen by servicemen in the real shows! Look for some “encores” by acts like the Andrews Sisters, Sonny & Cher and the Blues Brothers. An army travels on its stomach, so be sure to fortify yourself at Coburn's Family Restaurant (2708 W. 18th Ave.; 1-620-341-9701), a local favorite known for its great burgers and delicious malts and milk shakes — all at affordable prices. You can also tour the William Allen White home, Red Rocks (927 Exchange St.),which is listed on the National Register of Historic Places. Call 1-620-342-1803 for details. Mr. K's Bicycle Museum , about 10 miles east of Emporia at 1929 Road 175, is well worth the drive. Retired bicycle shop owner John Kuhn and his wife, Carolyn, also run the homey Kuhn Ba Yah Bed & Breakfast, if you need a place to stay. You'll find lots to appreciate in Emporia — and lots of ways to show your appreciation of our country's veterans. Emporia is at the junction of I-35, I-335 (the Kansas Turnpike) and U.S. Highway 50, about 50 miles southwest of Topeka. 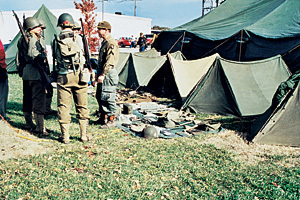 Veterans Tribute Week runs from November 5-11 in 2003. For details, call the Emporia Area Chamber of Commerce and Convention and Visitors Bureau at 1-800-279-3730. The Tallgrass Prairie National Preserve, which features nearly 11,000 acres of unspoiled prairie as the early pioneers first saw it, is about 20 miles west of Emporia, near the junction of State Highway 177 and Highway 50. About 15 miles north, where U.S. Highway 56 meets State Highway 177, is the historic town of Council Grove.